This month we have been talking all about influence. 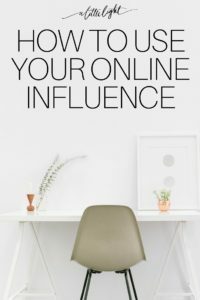 What is it, what it means to be an influencer, how social media impacts our influence and how we withhold it. The past week a sweet and passionate woman of God wrote a guest post for us. She dropped some knowledge on us that had us like whoa! She presented the case for hope being equal to influence: the one with the most hope has the most influence. We could drop mic there and leave it at that. Let’s share hope. Let’s influence because of hope, for hope, with hope. I love how freeing this is when it comes to my online life. I know I can share hope in all thing I share online, regardless of my platform or niche. Whether it is sharing about motherhood, my meal plans for the week, or my shopping spree mishaps. Because my God is a God of hope, and when I tell my story, I tell his story. I really want us to embrace that we can be Christians online rather than feeling like we ought to be online Christians. We know we have influence that is in all we do. In our offline communities it is found in relationships like mentoring, friendships, and our attitudes as we go about our day. It might be in the gifts we choose to share with others, the time and resources we choose to give them. In our online communities it is in our genuine conversations, the content we create, the fact that we have a presence and a platform where we choose to share whatever gifts, talents, passions, skills and experience that are unique to us. When we consider all the ways we can use our influence, it is important to realize that it is all rooted in the hope we have in God. As we start using our influence because of hope, we can consider these other points on how to use our influence . . .
Our influence needs to build up his kingdom rather than our own. It can be a runaway train to build up your platform, grow your traffic, increase your page views. I won’t say this doesn’t matter because there isn’t anything wrong with asking God to increase your influence and your reach. However, I do know the struggle in the hustle for your ego. I know how that knotty feeling in your stomach when you are desperate to see the numbers spike or reach a certain level because you want that validation. Remember that God paves a way for the work he has planned for you. He doesn’t want work to be done at the expense of your peace, or the peace of your family and your platform. We can focus on being faithful and obedient with the influence he has given us. We have much to learn with the ‘little’ before we are granted the ‘more’. Our influence needs to be unique to us. God makes all kinds of kinds, in fact, God makes one of a kinds! We are all sharing our unique identities online, calling them brands. We are ‘marketing’ ourselves online, we are also marketing Jesus to our audience. If we are all ‘falling into line’ with everyone else in terms of how we work online, our aesthetics, what we share, our approaches, etc. then we are echoing what many others are doing. This narrows the audience of women who our work is exposed to, it narrows the audience who will Jesus in our work. Your online platforms beg authenticity because Jesus isn’t one thing to one group of people. Jesus is everything to everyone. 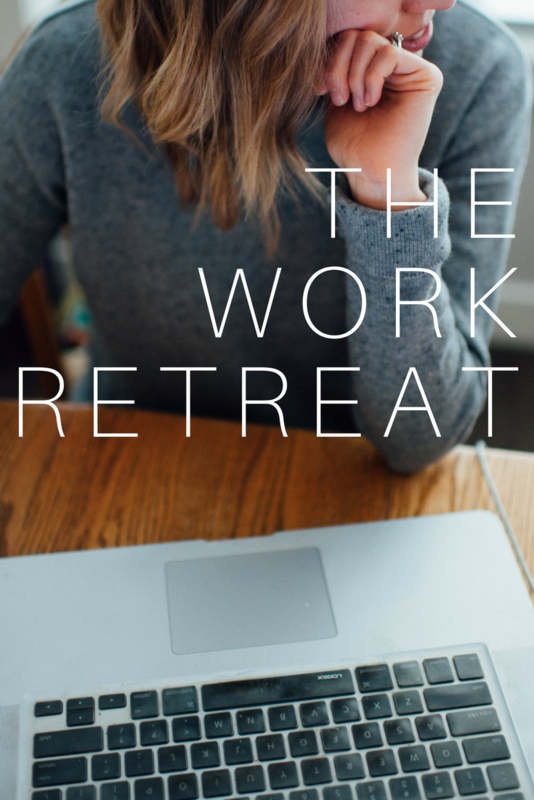 Do your work your way, with your individuality, with your vulnerability – so that the sum of our voices can drape the lovely tapestry of who Jesus is all over the online world. We must be stewards of our influence. Stewardship is biblically defined as “utilizing and managing all resources God provides for the glory of God and the betterment of His creation”. Our influence is a God-given resource. It is something we need to protect and use with diligence and care – especially online, where it can be easy to monetize our online work. After all, peer-to-peer marketing is more effective than ever and our words do matter to our audience. Being stewards of our influence also implies that we are honouring the influencee (for those of you who know this isn’t a real word, I mean the people we are influencing). We offer our audience what we think they are worthy of. Are they worthy of our God-given influence? Or are they a means to an end? There is nothing wrong with making money from your hard work. We hear many stories about online entrepreneurs who are quitting their jobs and building online empires. Some of us aren’t called to that level of profit. However, if you choose to monetize, remember that your obligation is to steward your influence and retain the trust of your readers and clients. Choose your brand and business partnerships with care. Let your influence support only those things you truly believe in. Don’t let your influence be a tool for making money for the sake of making money. For those of us who aren’t called to major monetization of our online work, our hard work can be justified when we measure success not by income but by the doing of the work. Us mountain-climbing, river-swimming, sun-seeking Canadian girls know that we live in a certain ‘culture’ of being a Christian. There are dos and don’ts when it comes to talking about Jesus. For many of us, this means we withhold sharing our faith online because we know our audience would be taken aback. For some of us without a large faith community in real life, it means we are considered strange for attending church and eyes roll when we invite friends to join us (or so I’ve heard). I love being inspired by the writings and work of many Christian women in the southern US states and when I feel like they seem so free and bold with their faith I also need to keep in mind that they are immersed in a very Christian-acceptant culture. I mean, for one, remember the first ever episode of Friday Night Lights when they all prayed over their Texan highschool football game?! Could you imagine if our Bantam hockey leagues were reciting the Lord’s prayer in the change room?! Could you imagine being in a culture where Jesus is more than just ‘alright with me’?! Okay, maybe it’s just me. Either way, it makes me wonder if we, as a culture of Canadian Christian women who are working online, are being called to something very specific. Being called to boldly respond to utilize the influence God is giving us. We have the position, the skills, the passion, to be able to use our influence to impact the local online conversations which impacts the offline culture. 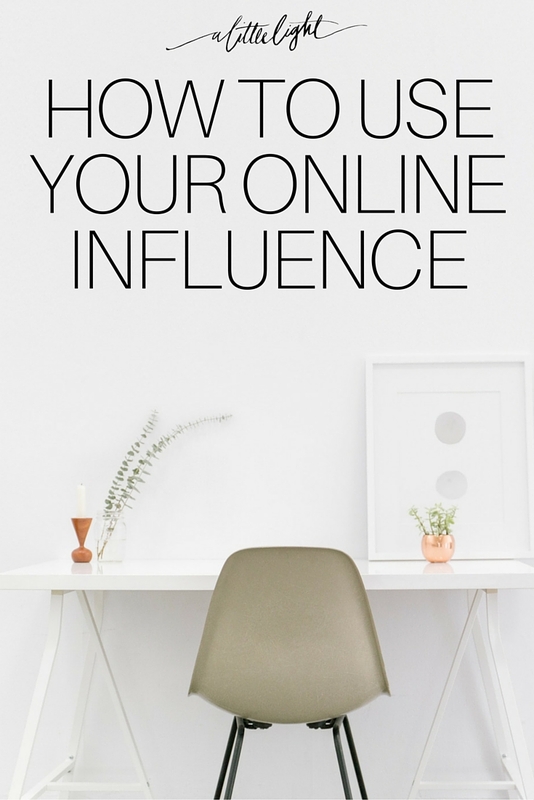 So, how will you use your online influence today? As we carry on our day – liking posts, commenting, creating content, let’s remember that our online life matters. How we use it matters. Our influence is a resource we are called to glorify God with. And it doesn’t have to be complicated. It is based on sharing hope. It is refined by boldness, authenticity, and giving your work to the hands of the Lord. Thank you for reading! We hope you will follow along with us on Instagram!